When are we going to realize that this life we live is not up to us? When will we begin to understand our lives are not our own that our very steps are ordered by God Himself? If God knew us before we were even formed, then He knows the plans He has for each step of our journey, if only we would wake at dawn with outstretched hands toward heaven in complete surrender, then just maybe we could move so freely in Him it would blow our minds. Yes, our King of Kings was born in a stable. Yes He was wrapped in cloth and laid to sleep in a manager. Yes it was cold. Yes it was humble. Yes it seemed all so unworthy for the Savior of the world. But He came to save. Let us take a step back and realize it is not about the baby and His meek birth, it is about God coming to this earth. A God who loves us unconditionally EVERYDAY and no matter what mischief we have gotten ourselves into. He waits each day at the setting of the sun with arms open wide to hold us close. He watches as we look past at times what He has done. He longs for us to seek Him daily, to be sought out in the middle of our busy lives. He waits, patiently. Why can’t we see that He will not leave us in our mess? Why do we fail to notice that He picks us up and dusts us off every time we fall? His love knows no end. We will forever visit that manger. We will be humbled by its power. However, we need to see past it and into what this birth really was. It was proclaimed years before it happened. God knew us, therefore, He knew we would need a Savior. He KNEW we would need to be loved. He KNEW we needed to be rescued from this tormented world. He knew. He knew. He knew. I want to get this so ingrained in my spirit that I cannot hear anything else. I want others to know this same truth. He came as an infant but He was always God. God came to save the world. He came to show us the ultimate gift, the gift of salvation. The gift which only needs to be given once. The grace gift of salvation is sufficient to cover a multitude of sins. 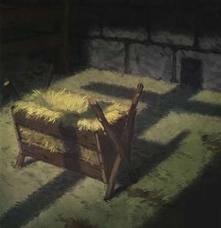 Why can we not see God in that manger instead of a child shivering in the cold? We seem to put so much emphasis on giving material things during this holiday season. Spending money we don’t have. Giving gifts until it hurts. Buying things we know are not really of value. Why not just give Jesus? The ultimate gift of grace and salvation, the only gift that truly keeps giving and it fits everyone’s needs. The gift of God Himself to a broken world. Peace be with all of you during this Christmas season. After all of the hustle and bustle I want us all to just rest. Yes, sit and rest. Close our eyes and see God. To quiet our souls and breathe. To manage to get our flesh to settle down and see what God has done for us through the birth of Jesus. My dream of unity would be so simple if we could all see that God is love and love is all we need. We were commanded by Jesus to love. It is so simple. Love was born in that manger some 2,000 years ago, not just a baby. Salvation was born to an unsuspecting couple, ordinary people, therefore it is also for those who seem unimportant. Let me assure you, you are important and you matter to God. Because He loves you, He sent Jesus. This world is nothing without God. This world cannot offer peace or joy. It cannot offer salvation or hope. Only God can save us. Only God can give us the peace we need daily, so my dream is simple: Choose to Love. Choose to love your neighbor. Choose to love yourself. Choose to love the life you have been given and be content in what God has given to you. For it will be through love that others will see the Light, the Light they should see when they gaze upon the manger. Here we are! It is Christmas and I will now share what I believe to be the real meaning of Christmas. Now I assure you this is my own opinion and after having traveled the road to the manger with me, I hope you will come to your own conclusion of what the real meaning of Christmas is in your lives. I feel on this day, Hope was born. Now we have discovered that our Father has not given us any specific date for celebration and this brings me to a place where I have decided this truth for my current journey of faith: The birth of the Jesus is a cause for celebration but then also of equal importance is His death. Since a date for neither is provided, should we not celebrate DAILY the manger and the cross? The birth and the death? Every day we should wake up and thank God for Jesus and this means the birth and the death for without either, we would be in quite a predicament. If we were to celebrate each day this awesome Gift, it would be open to all religions and there would not be a need for all the disagreements of how it should be celebrated. If we took the time to celebrate every day, gift giving or giving of ourselves would be a daily occurrence. We could surprise someone with a love gift and not have to say, “tis the season”, it would just be the right moment. Can you imagine for a moment what it would be like to have “Christmas” or “Easter” every day? It would remove the stress and the planning and make the moment of giving so much more rewarding because the gift would be spontaneous and not planned out. If we spent more time just sharing love instead of planning for these holidays, we could reach so many more hearts. For some, these holidays are the ONLY time they spend with Jesus. For others, it is the ONLY time spent with certain family members and sometimes that is only because it is “required” because of the “Holidays”. I mean no offense by this blog, I am simply showing a side that even I have not really seen before now. I think sometimes our focus is so far off base we cannot see the real meaning of the birth or the death. Everyday is a gift from God, why should we not be of the same attitude towards others? I love the idea of the holidays, do not get me wrong but at the heart of today, there was love. I spent time with family and enjoyed just being with them. I gave gifts to my children and I did this out of love, not obligation. I feel as though I would like to spend more of these days together. Jesus was born to give us Hope and if we are following in faith, the love God intended can emerge into this fallen world but it will be difficult if we continue to focus on these things only twice a year. Jesus needs to be an everyday of presenting ourselves to be used by God so that the Gift of His son will have relevance in the lives of those who do not yet know Him as their savior. As we followed the star and listened to the shepherds, saw the wise men in search of a King, our faith was ignited that hope was laying in a manger. We finally had a moment to hold onto, a place in time where life could begin to make sense. This birth of Hope is eternal and so is the death. I pray all will find peace on earth as they seek Jesus first in their lives. I Hope your Merry Christmas will be bright as you follow the star in faith. May your Season Greetings become , “How can I help you today?”. Perhaps your Happy Holidays will turn into days of celebration. Hopefully Tis the Season will fashion itself into days of thanksgiving and a willingness to give to others. Let’s make Christmas and Easter a part of everyday for as a very wise teacher taught me once upon a time, it is always today. Today is the day Jesus is born. Today is the day Jesus died. Today is the day when all things are possible. Why not make today count so God may be glorified, today. So as I conclude this 25 day blog on the REAL meaning of Christmas, I hope I have inspired some changes in the perspective of why we celebrate the way we do. Maybe this is a moment in time where we can all just take a few moments and reflect upon what it all means in our lives. Being a believer in Jesus means we are here to deliver hope to the hopeless and love to the lost. We are to be about the Fathers’ business everyday of our lives. Surely Santa was a grand idea, but a fairy tale for sure. Some say Jesus is a fairy tale too, but I beg to differ. The Happy Ending I am seeking is in heaven, a place of peace and tranquility, the purpose of my journey as a Christian, a daughter of the King. May your heart be touched forever by the hope found in the manger, because when all that has been prophesied is said and done, will we be in our mansions in heaven or left behind? The choice is up to each of us. Who will receive your utmost attention? Jesus or worldly traditions? Use your faith to choose. Be Blessed! Days 22 & 23: What IS the Real Meaning? When they saw the star, they were filled with joy! Wow! I cannot believe there are only two days left until Christmas! It is finally snowing here in Michigan and quite beautiful! This has been quite the journey towards Christmas for me with this blog. It sure has brought me back to the basics and I have learned many things. Today we discuss the star and the manger, two items which can be easily traced back to the birth of Jesus. 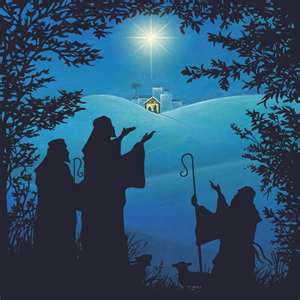 The star of course led the wise men and the shepherds straight to the place were the King lay in the hay. 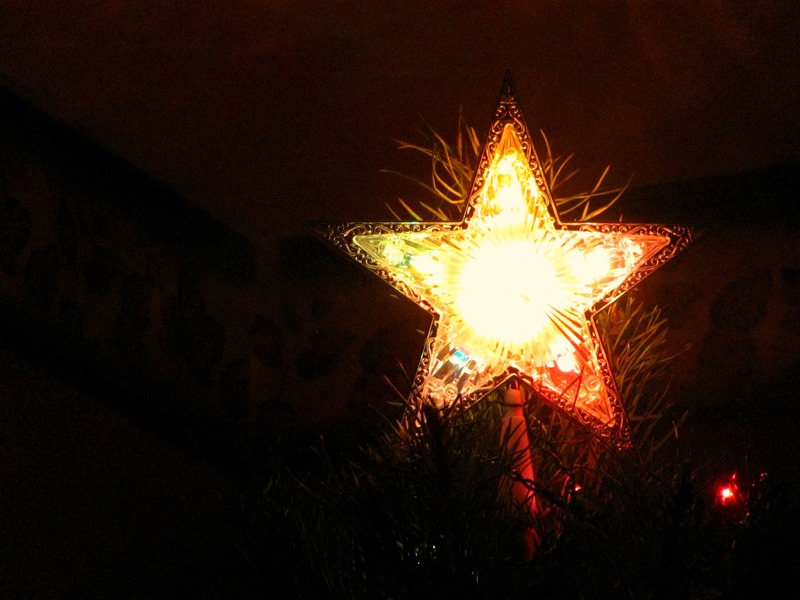 The star plays an important role in Christmas in the meaning we all need something to lead us where we are going, now that Jesus has been born, we no longer need a star to guide us, we need the Holy Spirit. The manger was the most humblest of beginnings for a King but it shows that no matter where we begin, God has great plans for us. What are you following? Are you following the star still in search of Jesus? Have you yet to come to the realization that He is calling you to journey with Him? Those who were following the star back then really had no clue to what there were headed for. They were seeking because of a story that God would send us a savior who shall save us from sin. We today already have seen the miracles which have occurred because of this wonderful birth in Bethlehem. Today our focus should be on Jesus, not the star if we have been led to accept Him as our Savior. If we are still searching for Jesus in our lives perhaps we are not on the narrow road where we should be. Jesus is in love with us and He desires for us to know the Father, therefore, we need to keep our eyes on Him alone and focus on doing what He is showing us to do for others. Can you imagine being born in the middle of a stable and being placed in a manger? How strange it must have been in all respects, yet I am sure Mary and Joesph were just fine with the idea, after all they knew God was behind all of this. If God wanted His only son to be born in a palace then He would have done so. If God’s desire was a house or a tent, then too it would have happened. No, God chose a stable. A humble beginning for such a great King, yet any other place just would not have made much sense in the way God works. So as I begin to wrap up this blog series, I realize that from the moment I stopped following the star and chose Jesus to be in my heart forever, things changed. Even though I was young when I found Jesus, I began to have an urgency for decency in my life. I wanted my life to mean something and I wanted to do good for others. Sure my journey has had its’ ups and downs, yet they have all been worth it. As now my focus has purely begun to dwell on Jesus, I see more clearly than ever why Jesus was born in a manger. We start out just a humble as our King and He is calling us to greatness. He is choosing us to be overcomers and this means even in the realm of understanding what His original agenda is for everything. What I mean by agenda is simple this: do we really think God intended for Christmas, which is suppose to be a celebration of the birth of His Son, to be this big of an event? With all of the hustle and bustle do we really have our focus in the right place? Sure we have followed the star to the manger but what have we done since we arrived? Wow, that bore heavy in my spirit just now. Have we really filled the call that is upon our lives? Have we truly sought out a Savior or is He just a way out of our troubles? I urge us all to stop following the star and pause for a moment at the manger to discover what the real meaning of Christmas is to us. Day 16: What IS the Real Meaning? 12And you will recognize him by this sign: You will find a baby wrapped snugly in strips of cloth, lying in a manger.”13 Suddenly, the angel was joined by a vast host of others—the armies of heaven—praising God and saying, 14 “Glory to God in highest heaven, and peace on earth to those with whom God is pleased.” 15 When the angels had returned to heaven, the shepherds said to each other, “Let’s go to Bethlehem! Let’s see this thing that has happened, which the Lord has told us about.” 16 They hurried to the village and found Mary and Joseph. 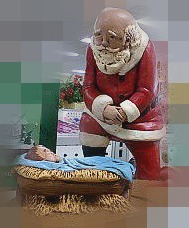 And there was the baby, lying in the manger. 17 After seeing him, the shepherds told everyone what had happened and what the angel had said to them about this child. 18 All who heard the shepherds’ story were astonished, 19 but Mary kept all these things in her heart and thought about them often. 20 The shepherds went back to their flocks, glorifying and praising God for all they had heard and seen. It was just as the angel had told them. Tonight I feel as though I was visiting with shepherds. Truly these fit into the Christmas scene and are one of my favorite parts of the whole story because I can totally identify with them. As you read the story of the birth of Jesus you can feel the excitement arising in the shepherds as they witness the angels singing and the realization that God has given to the world what He has promised them: A Savior. As they begin to rejoice can you imagine the journey from the fields to the manger? I can see it as if I am amongst them. I am a leader type person and I would just be talking about this baby the whole way there and back! At a local church there was an illusion show and a concert this evening and my heart opened up again to the possibility of Christmas. Tonight for the first time since I began writing this blog, I am beginning to feel the Christmas Spirit creeping in. Though I had a tough day with most of it being spent in hospitals caring for those important people in my life, I began to see the goodness in God as this concert unfolded. 33 Miles and Harris III put on a spectacular show for those who were there, however God started letting me see past the music and magic. He spoke through the musicians and illusionist who in the midst of performing, showed how they felt about Christmas. When the lead singer began to share in almost exactness the points of my blog, I understood that I was not the only one with these feelings of how far off base we are from the real meaning of Christmas. For a few moments tonight I felt as if I was witnessing the shepherds retelling the wonderful story of the birth of Jesus. As they spoke I began to get this tingle again in my heart and my hope began to rise. I knew God was poking at me to wake up and see I was on the right track, yet He wondered why I did not feel the joy of the season. Like someone tonight said in this month of Christmas people are more giving, should we not be like this in all the other months of the year? Christmas should be a year around gesture, not just for a season. We learn from our blessings, we receive…the more we give the more we get in return. Now I am not talking about money or extravagant gifts, I am speaking about the more we give with our hearts instead of our wallets, the more God can bless us. So tonight I give thanks for the many who are current shepherds for Jesus. I am grateful for those who can still be excited about the birth and have a hard time containing their joy. I truly believe in the magic of Christmas as it has this way of capturing the hearts of those who witness it. I am praying for all who seek something which is void in their life that they stumble upon a true shepherd, someone who can speak life into the Spirit of Christmas again. One who knows why all of this came upon a midnight clear to begin with. 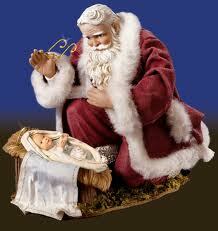 A shepherd who is so focused on the baby in the manger that the rest of the world begins to slowly fade away. Day 15: What IS the Real Meaning? hy do we have a decorated Christmas Tree? In the 7th century a monk from Crediton, Devonshire, went to Germany to teach the Word of God. He did many good works there, and spent much time in Thuringia, an area which was to become the cradle of the Christmas Decoration Industry. Legend has it that he used the triangular shape of the Fir Tree to describe the Holy Trinity of God the Father, Son and Holy Spirit. The converted people began to revere the Fir tree as God’s Tree, as they had previously revered the Oak. By the 12th century it was being hung, upside-down, from ceilings at Christmastime in Central Europe, as a symbol of Christianity. The first decorated tree was at Riga in Latvia, in 1510. In the early 16th century, Martin Luther is said to have decorated a small Christmas Tree with candles, to show his children how the stars twinkled through the dark night. So today we arrive at famous Christmas Tree. We spend lots of time on this part of Christmas. Some trudge through the woods picking out and cutting down just the right tree. Others go to a Christmas tree farm to pick out the perfect one. And still many others choose to buy a fake tree at the local department store where there are many colors and sizes to choose from. Some have lights, some are white, some are green: the possibilities are almost endless. Then after picking out said tree, we go about fitting it into our living spaces and spend the next few days before Christmas fussing with it. Those of us who have animals spend a good time scolding our dear pets for even glancing at the tree. Those with small children have the added headache of making sure ornaments and what not do not find there way into little hands and mouths. When one gets a real tree, often there is the danger of it drying out and then of course the constant finding of pine needles for up to months later. Some have lost their homes because they have started on fire. 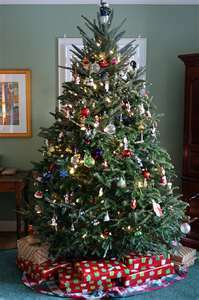 Now, I was intrigued to find the above story about the history of the tree because it seems as though it started out as a tribute to God and the reason for our celebration, however Christmas trees just like everything else Christmas, have taken on a life of their own over the years. Growing up the Christmas tree was a source of argument for my parents and often created a cold drift in my parents moods just because someone forgot to water the tree. Once again how did we get so far off from what Christmas really is? 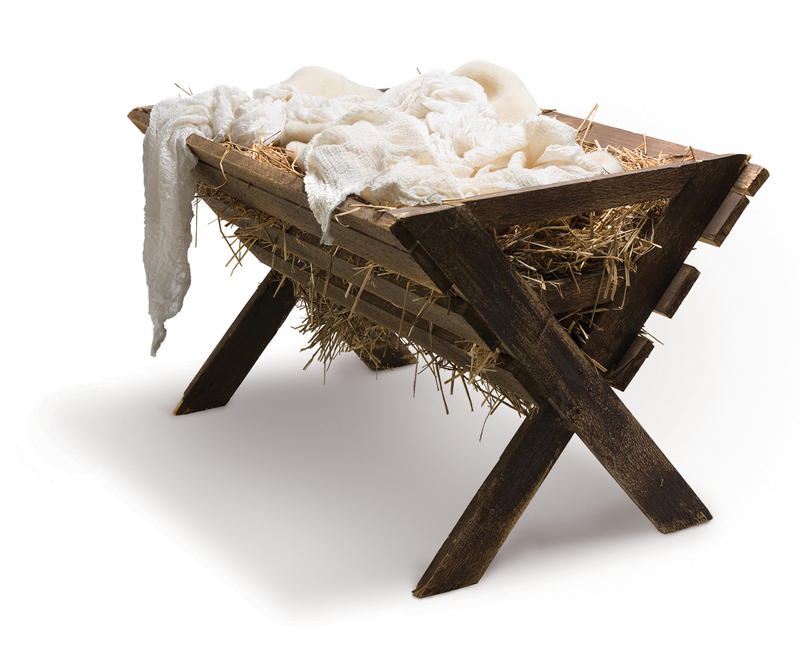 If we placed a manger in our living rooms, would it cause so much chaos? If we removed our focus from the positioning of the “lights” would we be able to actually see the “Light” of Christmas instead? What if we spent the endless amounts of money we spend on ornaments, garland, tinsel and lights on feeding the hungry or clothing those who need it? So many possibilities. I know in my younger days I disliked the tree. Though I found it to be beautiful, it was often a source of argument in my family. First it was the “it’s too big or too small” issue. Then it was the endless hours of checking the lights to find out which one was burnt out. After that it was “the lights are not hung correctly” discussion soon followed by my mom getting mad at my dad making it seem like it was his fault entirely that the branches were not even. This would lead to dad getting out the pruning shears and chopping away only to be yelled at again because now the tree was too bare. And Lord forbid if someone forgot to water the tree or put an aspirin in the tree stand. It was just a never ending dilemma right up until the day it was taken down. Even in my own family as an adult we had our issues and maybe that is why I have just not gotten around to putting up the tree this year, too much hassle. Please do not take me wrong on this Christmas tree issue, I love decorated trees and I love the traditions we had in our household, I am just using this as one of my examples of how far we have removed ourselves from the real meaning of Christmas. If we spent the time this year on others instead of a tree, what a difference we could make in others lives. The focus of Jesus being born was to give us hope and comfort leading to a life of joy, why not start doing that in respect to others this Christmas season? Days 11, 12, 13 & 14: What IS the Real Meaning? Inside, the people were all shouting, some one thing and some another. Everything was in confusion. In fact, most of them didn’t even know why they were there. Okay, sorry I have neglected my blog, just happen to be going through a valley right now. God is searching my heart and I am under His conviction. It all kinda started with this blog actually and it has been quite the ride. Well, as I digress, let us return our focus back to the topic of the blog, what is the real meaning of Christmas? So to catch up I am taking the Santa Claus issue. Now it is quite obvious Santa is not a part of the original Christmas. Santa is certainly an imaginative creature yet he seems to have taken over the scene. Instead of teaching children at an early age to appreciate the reasons behind gift giving, we fill their minds with this man in a jolly red suit. As a mom, I used to get “jealous” of Santa because he received all the glory for our hard work as parents. He got all the thank yous as we sat back and worried about how we wee going to pay our bills since we had just spent our last penny on getting enough candy for the stockings. There are several different stories behind the man in the big red suit, many of which have to do with giving and helping the poor. So to me the idea of Christmas with Santa is appealing as it was intended to help; yet so irrelevant to the birth of our saviour. Do we totally feel this is true today? Sure there are several ways to give during the holidays to those who are in need, however what percentage of our giving is to others? Compared to what we spend on our own families, what do we give to help others during the season of giving? Then there are the elves and reindeer living with Santa in the North Pole. Now I could get creative and lead all these things into the Christian side of Christmas, however it is not the purpose. As I get closer to the day of Christmas I am still concerned at how little the focus is on the Baby in the manger. Children are excited for Christmas not because of the Hope which has arrived but because they will be visited by Santa who is bearing gifts for them, when in reality they only need one gift: Jesus. How do we get back to reality? 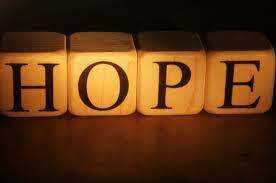 How do we turn our focus to the simple gift of Hope? It almost seems like Santa is too much to contend with. As I am searching my very own heart, I can tell you that I have yet to put up any Christmas in my home. I really am feeling drawn to just putting up a manger and calling it good. The manger is filled with such hope and promises unlike the things we have to display Christmas now. You never need to rearrange the ornaments or rewrap gifts, it is just there in all of its’ glory waiting for you to accept it for what it is: Hope. I think perhaps all the “Santas” out there are in need of some Hope in their lives.